What do I wear to the interview? This is a question millions of people around the world think over when planning to go for an interview. The way you dress to a job interview makes a huge statement about yourself before you even open your mouth. Whether you know it or not, your appearance is the first thing people notice about you. Its said that first impressions are usually formed within the first 30 seconds. 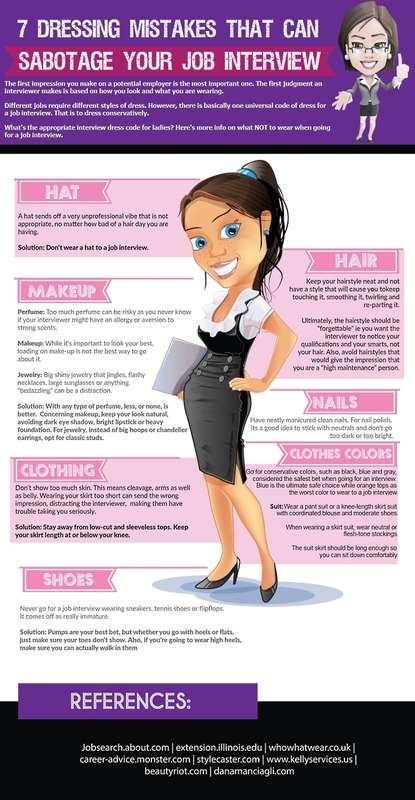 Gee, a blogger that owns learnershipsa.com, has created this info graphic titled "7 Dressing Mistakes That Can Sabotage Your Job Interview" that gives practical tips on what NOT to wear for your next job interview. This guide should help you enhance your job interview in the future. Great post for those preparing to get interviews. Those are great tips, I didn't know things like makeup and nails could sabotage an interview. Thanks for the tips Linda. Yes kwanza those are key..make up and nails. Very true and helpful tips!